Sometimes older films, and particularly influential ones, can gain an almost legendary status, making it almost immune from criticism and somehow admitting it to the ephemeral canon of cinema, a phenomenon that should perhaps be called The Citizen Kane effect. Metropolis, Fritz Lang’s silent sci-fi, is one such film, lent even more mythical status by the events that surround the film’s history. Costing 5 million reichmarks but making only 75000 back, upon release Metropolis was seen a giant flop and copies of it were summarily destroyed. As a result, reels and reels of it were missing for decades, so various different cuts had existed ever since, including one by Giorgio Moroder (available in HD with this edition). In 2008 a copy of it was found in a film museum in Buenos Aires, and much of what was lost was restored for the 2010 re-release, a landmark discovery for fans of sci-fi and film archiving. This is, for now, the definitive cut and as close to what audiences saw in 1927 as is possible. Historically, therefore, it’s a fascinating film, as you see what the big budget flops looked like in the twenties, and you can work out how various shots were achieved with fairly limited technology. 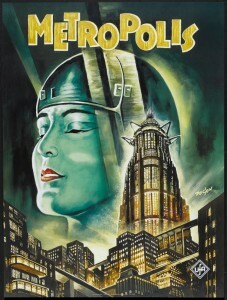 Visually, as well, Metropolis is a marvel, rightly remembered for its dystopian world-building and incredible sets. Dystopias are ten-a-penny in cinema these days, thanks to the boom in young adult literature that seems obsessed with teenagers dying, but one can only imagine what it was like seeing such a monumental vision of the future on film in the 1920s. The rich tower over the poor, who all trudge around in dark jumpsuits, suggesting that ‘The Roaring Twenties’ were only roaring for some of the population. With hindsight, the spectre of the great depression looms large over the film, a blight that would strike Germany only three years after Fritz Lang’s prescient film. It’s an impressive, thoughtful and at times dazzling sci-fi, and many modern films in the genre show directly its influence, sometimes outright copying it in their admiration for this dystopian titan. As such, it’s essential viewing for anyone with an interest in science fiction, and this Blu Ray edition from Eureka’s Masters of Cinema collection, with documentaries, explanatory titles and essays to accompany it, is the perfect introduction to such a revered classic. However, what the rediscovered reels reveal is also a film that is poorly paced, while it doesn’t need the missing footage to highlight the terrible acting. Fritz Lang clearly knew how to direct and pace a film, as his M is an incredibly compelling and nuanced thriller. It just appears that with Metropolis he was so consumed with the world-building and visuals that he forgot to tell a story within that world, a little like C.S. Lewis in Out of the Silent Planet. H.G. Wells wrote an excoriating review upon its release – well worth reading in full – in which he claimed that “Never for a moment does one believe any of this foolish story; for a moment is there anything amusing or convincing in its dreary series of strained events. It is immensely and strangely dull.” While it is difficult to agree wholeheartedly with Wells, with the heightened theatricality of it all, the scenes that could each be trimmed by minutes and a denouement that becomes an endurance test, he isn’t too far wrong. For historical value and for its visuals alone, Metropolis is well worth a watch for any film fan, just don’t expect to be particularly entertained. Extras: The most interesting aspect of the extras, a lengthy booklet with original reviews and more modern essays, was sadly unavailable for review. Fear not, though, as a 55 minute documentary, while a little dry, covers the story of the film’s journey from conception to today’s edition, as well as commentaries, trailers and different versions enough to satiate the most dedicated fans. Eureka’s Metropolis steelbook is out now.